This waif-like girl is among Picasso’s cast of people from the margins of society. A melancholic mood is conveyed with veils of paint. The chemise accentuates, rather than disguises, the slenderness of the girl’s body that the painter shows as sexually desirable. She is fragile, perhaps sickly. 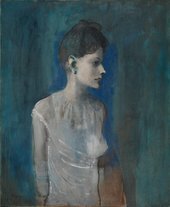 Her delicate pink flesh evokes the skin-colour that Picasso’s friend Guillaume Apollinaire identified among street performers: ’that purplish pink one finds on the cheeks of certain fresh young girls close to death’. Inscribed 'Picasso | 05' b.l. Lit: J.H. Johnstone, 'La Collection Stoop' in L'Amour de l'Art, 1932, p.201; Christian Zervos, Pablo Picasso (Paris 1932), Vol.1, No.307, repr. pl.138 as 'Femme à la Chemise'; Georges Boudaille, Pierre Daix and Joan Rosselet, Picasso 1900-1906 (Neuchâtel 1966), No.XII.5, p.258 repr. This picture is inscribed 05, but D.-H. Kahnweiler said that the original photograph in his files bears the date 'autumn 1904'. The picture did not enter his possession, however, until 1909. The same model appears in other works of this time, including a drypoint (also showing her in profile to the right), which is dated on the plate February 1905 (Geiser, 1933, No.5). In a drawing dated 1904 and a painting in gouache dated 1905 (Boudaille et al., Nos.D.XI.26 and XII.4), she is seen feeding a baby, while in the present work one of her breasts is bared, possibly for this purpose. She also seems to appear in several other gouaches and prints of 1905 accompanied not only by the baby but by a man dressed as a harlequin or an acrobat, who is evidently the father, in the setting of a circus tent (e.g. 'The Harlequin's Family' and 'Family of Acrobats with a Monkey', Boudaille et al., Nos.XII.6 and XII.7). An installation photograph of the Moderne Kunst Kring exhibition at the Stedelijk Museum, Amsterdam, in October-November 1911 shows this picture hanging on the wall among other works by Picasso and Braque. As Frank Stoop, who was of Dutch origin, is said to have acquired it about 1912, it is possible that he bought it from this exhibition.